According an independent audit, Spain’s banks will need an injection of 59.3 billion euros ($76.3 billion) to survive a serious downturn. The amount is broadly in line with market expectations of 60 billion euros, and follows so-called stress tests of 14 Spanish lenders. Much of the money is expected to come from the eurozone rescue funds, the current EFSF and the future ESM. Spain said in July that it would request eurozone support for its banks. The Spanish banking sector has been in difficulty since the global financial crisis of 2008, and the subsequent bursting of the country’s property bubble and deep recession. The European Commission welcomed the announcement, saying in a statement that it “is a major step in implementing the financial-assistance programme and towards strengthening the viability of, and confidence in, the Spanish banking sector”. Christine Lagarde, managing director of the International Monetary Fund, praised the independent valuation of Spain’s banks, saying it had been “thorough and transparent”. 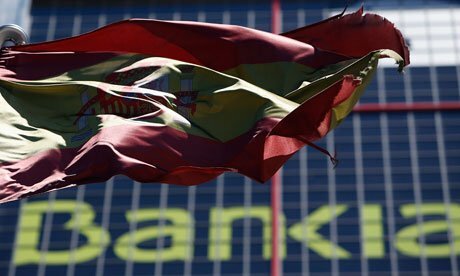 The audit calculation that Spain’s banks will need 59.3 billion euros is a worst-case scenario, and does not take into account any future plans by the lenders themselves to raise their own capital. The country’s economy minister Fernando Jimenez Latorre indicated that it may need to borrow about 40 billion from the eurozone rescue funds. Bankia was found to be the bank most in need of additional capital, requiring 24.7 billion euros. It was followed by Catalunya Bank (10.8 billion euros), Novagalicia (7.2 billion euros), Banco de Valencia (3.5 billion euros), Banco Popular (3.2 billion euros), Banco Mare Nostrum (2.2 billion euros), and Ibercaja-Liberbank-Caja (2.1 billion euros). Seven Spanish banks have no need for extra capital – Santander, BBVA, Caixabank, Kutxabank, Sabadell, Bankinter, and Unicaja. The audit was also based on a number of assumptions, including that Spain’s economy will contract by 6.5% between 2012 and 2014. The Open Europe think tank suggested many of these were overly optimistic, however. “These tests do look to be more intense than the previous ones but ultimately the optimistic assumptions do instantly raise questions over their credibility,” the group said. It added that a worsening economic situation would also increase the number of loans which are defaulted on and hit the value of the foreclosed properties which banks own. The bigger question remains whether the Spanish government will have to follow Greece, Portugal and the Republic of Ireland and request a full international bailout, involving loans that have to be paid off by the state, as well as close monitoring of its economy by its international creditors. While Madrid continues to publicly deny this, the markets consider it only a matter of time. On Thursday, the Spanish government announced its latest austerity budget. Against a backdrop of violent protests, it outlined new spending cuts, but protected pensions. Spain is struggling with a shrinking economy and 25% unemployment. Comments from its central bank earlier this week indicated that the country’s recession deepened in the past three months. As tax revenues fall and benefits payments rise in a recession, this will make it even harder for Spain to get its finances under control. How fashion staples changed over the last 25 years. Skinny jeans, leggings and blazers are the new trends.